In a project funded through NASA’s Innovative Advanced Concepts Program, researchers from University of Washington and MSNW are calculating the potential for expeditions to Mars using a rocket powered by fusion. Human travel to Mars has long been the unachievable dangling carrot for space programs. Now, astronauts could be a step closer to our nearest planetary neighbor through a unique manipulation of nuclear fusion, the same energy that powers the sun and stars. 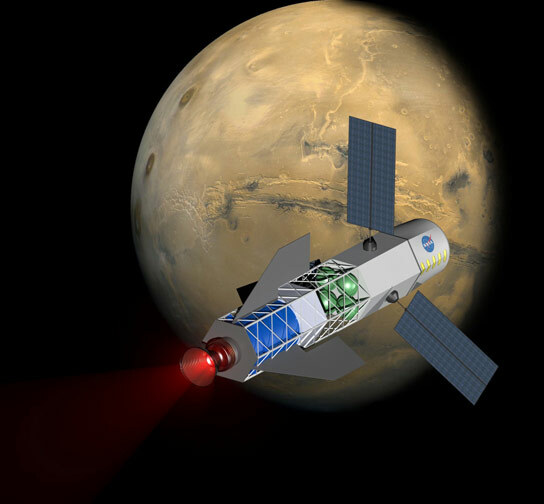 University of Washington researchers and scientists at a Redmond-based space-propulsion company are building components of a fusion-powered rocket aimed to clear many of the hurdles that block deep space travel, including long times in transit, exorbitant costs and health risks. The project is funded through NASA’s Innovative Advanced Concepts Program. Last month at a symposium, Slough and his team from MSNW, of which he is president, presented their mission analysis for a trip to Mars, along with detailed computer modeling and initial experimental results. Theirs was one of a handful of projects awarded a second round of funding last fall after already receiving phase-one money in a field of 15 projects chosen from more than 700 proposals. NASA estimates a round-trip human expedition to Mars would take more than four years using current technology. The sheer amount of chemical rocket fuel needed in space would be extremely expensive – the launch costs alone would be more than $12 billion. Slough and his team have published papers calculating the potential for 30- and 90-day expeditions to Mars using a rocket powered by fusion, which would make the trip more practical and less costly. But is this really feasible? Slough and his colleagues at MSNW think so. They have demonstrated successful lab tests of all portions of the process. Now, the key will be combining each isolated test into a final experiment that produces fusion using this technology, Slough said. The research team has developed a type of plasma that is encased in its own magnetic field. Nuclear fusion occurs when this plasma is compressed to high pressure with a magnetic field. The team has successfully tested this technique in the lab. Only a small amount of fusion is needed to power a rocket – a small grain of sand of this material has the same energy content as 1 gallon of rocket fuel. To power a rocket, the team has devised a system in which a powerful magnetic field causes large metal rings to implode around this plasma, compressing it to a fusion state. The converging rings merge to form a shell that ignites the fusion, but only for a few microseconds. Even though the compression time is very short, enough energy is released from the fusion reactions to quickly heat and ionize the shell. This super-heated, ionized metal is ejected out of the rocket nozzle at a high velocity. This process is repeated every minute or so, propelling the spacecraft. In the video below, the plasma (purple) is injected while lithium metal rings (green) rapidly collapse around the plasma, creating fusion. The UW-MSNW team has successfully demonstrated the metal-crushing process in the UW Plasma Dynamics Laboratory in Redmond. The video below, taken from a 3-D computer simulation, shows three lithium rings as they collapse around plasma material. The team had a sample of the collapsed, fist-sized aluminum ring resulting from one of those tests on hand for people to see and touch at the recent NASA symposium. Now, the team is working to bring it all together by using the technology to compress the plasma and create nuclear fusion. Slough hopes to have everything ready for a first test at the end of the summer. The Plasma Dynamics Lab – where Slough and colleagues, including UW graduate students, build and conduct experiments – is filled wall-to-wall with blue capacitors that hold energy, each functioning like a high-voltage battery. The capacitors are hooked up to a giant magnet that houses the chamber where the fusion reaction will take place. With the flip of a switch, the capacitors are simultaneously triggered to deliver 1 million amps of electricity for a fraction of a second to the magnet, which quickly compresses the metal ring. The mechanical process and equipment used are reasonably straightforward, which Slough said supports their design working in space. In actual space travel, scientists would use lithium metal as the crushing rings to power the rocket. Lithium is very reactive, and for lab-testing purposes, aluminum works just as well, Slough said. Nuclear fusion may draw concern because of its application in nuclear bombs, but its use in this scenario is very different, Slough said. The fusion energy for powering a rocket would be reduced by a factor of 1 billion from a hydrogen bomb, too little to create a significant explosion. Also, Slough’s concept uses a strong magnetic field to contain the fusion fuel and guide it safely away from the spacecraft and any passengers within. Research partners are Anthony Pancotti, David Kirtley and George Votroubek, all of MSNW; Christopher Pihl, research engineer in aeronautics and astronautics at UW; and Michael Pfaff, a UW doctoral student in aeronautics and astronautics. Magnetoshells: Plasma Aerocapture for Manned Missions and Planetary Deep Space Orbiters, David Kirtley. Poster from NIAC Spring Symposium (2013). The Fusion Driven Rocket: Nuclear Propulsion through Direct Conversion of Fusion Energy, John Slough, Anthony Pancotti, George Votroubek, David Kirtley, Christopher Pihl, Michael Pfaff . Poster from NIAC Spring Symposium (2013). The Fusion Driven Rocket. Slough, J., Pancotti, A., Kirtley, D., Pfaff, M., Pihl, C., Votroubek, G., NASA NIAC Phase II Symposium (2012). In-Situ Electromagnetic Propulsion for Martian and Terrestrial Atmospheres. Kirtley, D. Pancotti, A., Slough, J. and Pihl, C. AIAA Joint Propulsion Conference (2012). Mission Design Architecture for the Fusion Driven Rocket. Pancotti, A., Slough, J. Kirtley, D. et al. AIAA Joint Propulsion Conference (2012). A Magneto‐Inertial Fusion Driven Rocket. J. Slough, D. Kirtley, A. Pancotti, M. Pfaff, C. Phil, G. Votroubek. 39th IEEE International Conference on Plasma Science (ICOPS) (2012). Nuclear Propulsion Through Direct Conversion of Fusion Energy. Slough, J. Kirtley, D. Pihl, C. and Pancotti, A.NASA NIAC Symposium (2012). Steady Operation of an Electromagnetic Plasmoid Thruster. Kirtley, D., Slough, J., Pfaff, M., Pihl, C. Joint Army Navy NASA AirForce Conference (2011). The Fusion Driven Rocket. Slough, J., Kirtley, D. Pfaff, M., Pancotti, A. NASA Institute of Advanced Concepts Review (2011). Pulsed Plasmoid Propulsion: Air-Breathing Electromagnetic Propulsion. Kirtley, D., Slough, J., Pihl, C. International Electric Propulsion Conference, IEPC-2011-015 (2011). Plasma Magneto-Shell for Aerobraking and Aerocapture. Slough, J., Kirtley, D., Pancotti, A. International Electric Propulsion Conference, IEPC-2011-303 (2011). Nuclear Propulsion based on Inductively Driven Liner Compression of Fusion Plasmoids. J. Slough and D. Kirtley. AIAA Aerospace Sciences (2011). Development of High-Power Electic Propulsion Technology for Near-Term and Mid-Term Space Power. D. Brown, D. Kirtley, et al. Joint Army Navy Airforce NASA Journal (2010). Pulsed Inductive Macron Propulsion. D. Kirtley and J. Slough. Joint Army Navy Airforce NASA Space Propulsion Systems Conference (2010). The ELF Thruster. J. Slough, D. Kirtley, and T. Weber. International Electric Propulsion Conference 2009-265 (2009). Preliminary Performance Measurements of the Air-Breathing ELF Thruster. J. Slough, D. Kirtley, and T. Weber. Joint Army Navy NASA Air Force Conference, Orlando Florida (2008). 3 Comments on "Nuclear Fusion Could Power Future Human Expeditions to Mars"
I can see this working and then in 15 years being seriously improved by making a reusable metal sheathing that allows only the energy produced to be shot out the nozzle. Fusion ships (daedalus) have been on the drawing board for years but only as concepts. Let’s see this one go somewhere! How real is this thing? It seems ITER people are just wasting their time and others’ money? They could just borrow the idea from these gentlemen and finish the job quickly, judging from the rather lighthearted account of the achievement of this “feat”. It looks as if it is going to be opertional in some months. That sort of reporting unfortunately is fit only for publishing in a newspaper by correspondents who are even incapable of differentiating between kwhours and MWs etc, rather than a serious site such as yours. Will this device produce enough sustained thrust to achieve a constant 1G acceleration/deceleration that would reduce the trip to Mars to hours instead of months?